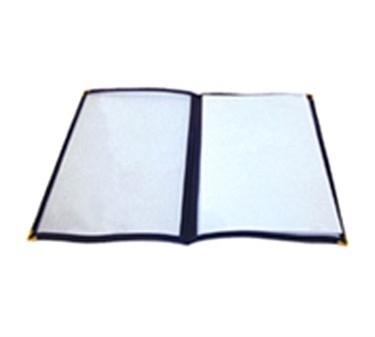 Showcase your delicious menu options in the Winco PMCD-9B Blue Double Fold Menu Cover 9-1/2" x 12" This high visibility menu features four 9-1/2" x 12" clear viewing surfaces surrounded by a blue vinyl border and brass corners, that will accentuate your menu selections. Slip standard size paper menus inside the double panel plastic cover and you can create versatile menus that match your restaurant theme and decor. With this convenient menu cover, you can also update your menu as often as needed, and it's clear plastic surface is easy to wipe down and keep clean as befits your fine food establishment.